The hashtag for Grand Prix New Jersey is #GPNJ. Join the conversation. An intense debut weekend of Guilds of RavnicaStandard has gone out with a bang, with Eli Kassis winning his first Grand Prix title in style. Just hours early, his Team Face to Face teammate Gabriel Nassif finished in second place across the ocean at Grand Prix Lille, making it a pretty great first weekend for the team heading into the Pro Tour soon. The decks were all over the map throughout the two days. Golgari came in a heavy favorite, but early on the new Izzet Phoenix deck made its presence known, littering the top tables with its Splinter Twin–like combo of Maxmize Velocity and Crackling Drake, with players trading stories of their most damage in a single swing. Soon after, the entire Peach Garden Oath, playing Brad Nelson's Boros Angels deck crowded the top tables, as the designer was back at X-2. But Nelson proved the Standard stalwart, netting a Finals appearance in the same venue his brother won just last year. 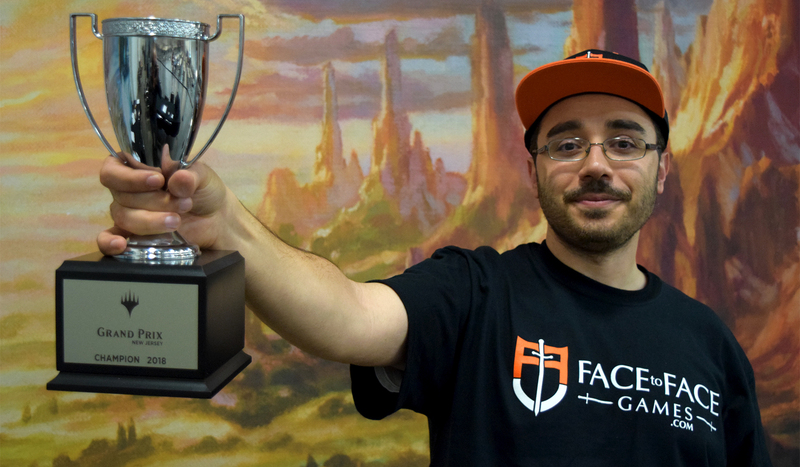 Alas, it was Jeskai Control which commanded some of the Top 32, and claimed the trophy. Everything is moving quickly in Standard. Where it will be come Pro Tour Guilds of Ravnica? We'll soon find out. It was an intense first day for Guilds of Ravnica Standard in New Jersey. If we count Esper under the Dimir umbrella, all five guilds had strong showings at this 1,200-player outing. The rain deterred exactly no one, as most everyone is excited to christen these new brews on the Grand Prix circuit. Golgari came in the most represented, and the deck most felt was at the top of the heap, but Selesnya Tokens has been showing up at the top tables a little higher than expected — and the new hotness Izzet Phoenix has been making for match-ups that end with a single attack step. Though Boros Angels didn't put any competitor to the full 8-0, Owen Turtenwald, Reid Duke and William Jensen are all 7-1 with the deck, and are still strongly threatening Top 8 berths. Playing a bevy of archetypes, including a Jeskai Midrange and a Boros Mentor list,Orlando Lucas, Tariq Patel, Eli Kassis, Thomas Yarbrough, Andrew Tenjum, Nizar Sarhan, Jonathan Sukenik, Matt Nass, Ben Laufer, and Mitchell Garrant are the ones to beat tomorrow — and the players lurking beneath them will see if they can do just that.